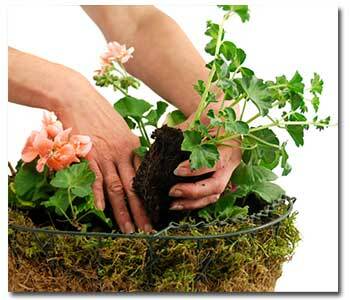 Ok, you’ve decided upon your theme, have an idea of the plants that you want and have chosen the container. Excellent. Next you need to prepare your potting mix. Select a high quality potting mix such as Kellogg® Gardner & Bloome® Potting Soil and mix in a controlled-release fertilizer. Also, remember that moisture retention is frequently a problem with hanging baskets (and all containers for that matter), so mix in a soil polymer that will hold on to the moisture between watering. If you have chosen to create a succulent hanging basket, you will need cactus mix and probably won’t need the slow-release fertilizer or the moisture polymer. A great cactus mix is Kellogg® Gardner and Bloome® Cactus Planting Mix. Makin’ it hang and make it drain. If you did not purchase a container made specifically for hanging, you may need to create a hanging device for it. 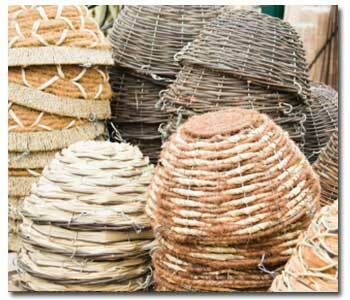 You’ll need to attach some strong wire or rope, or purchase a hanging platform for your basket to sit on. If your container did not have an predrilled holes, you’ll want to do that now as well for proper drainage. 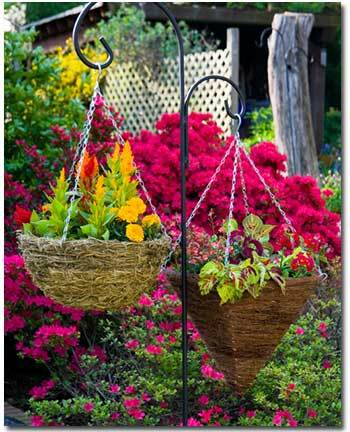 Of course, you can always cheat and buy hanging baskets which are pre-filled with beautiful floral arrangements. No shame in that!